Ships in 5 business days - FREE GROUND SHIPPING in the USA on orders over $25! ACOR's Sole Defense® EZ-Fit Orthotics utilize advanced materials to increase support, improve cushioning and reduce the overall thickness of the forefoot 40% over our traditional orthotics in the forefoot, making them easier to fit most footwear. Made from high-quality Acor Microcel Puff® and Microcel Puff® FM™, they are also heat-moldable! Features: Excellent support, 40% thinner than our traditional orthotics in the forefoot area, lightweight, fits most footwear, HEAT-MOLDABLE! WHOLESALE customers- Make sure you are logged in to your account and click HERE to shop for Acor Sole Defense EZ-Fit Dual Layer SD-2001L Orthotics. 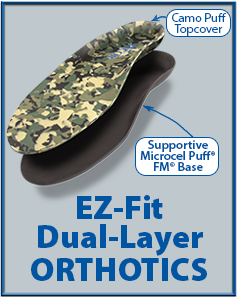 Click the button below to add the Acor Sole Defense EZ-Fit Dual Layer SD-2001L Orthotics to your wish list.